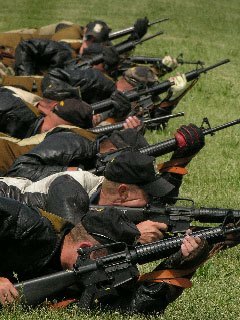 The 2008 Interservice Rifle Match was held recently in Quantico, Virginia. Shooters of the U.S. Army Marksmanship Unit (USAMU) won EVERY team match of the competition. More than 125 shooters from the Army, Navy, Marine Corps, Reserve and National Guard competed in the rifle championships at Quantico Marine Corps Base. The Army Marksmanship Service Rifle Team won the prestigious Interservice Rifle 10-Man Team Match, winning the Service Rifle Interservice Championship Trophy. Team coaches were Sgt. Walter E. Craig Jr. and Sgt. 1st Class Emil Praslick III. Shooters were Sgts. 1st Class Lance D. Dement, Grant L. Singley and Kyle A. Ward, Staff Sgts. Joel S. Micholick and Tobie L. Tomlinson, Sgt. Brandon K. Green, Spcs. Tyrel L. Cooper, Calvin G. Roberts, Matthew T. Sigrist and Nathan J. Verbickas. Ward shot highest score of 495 points out of a possible 500. The USAMU Team coached by Praslick beat 12 teams to win the Marine Corps Infantry Trophy Team Match. Team shooters were Cooper, Dement, Green, Pace, Singley and Ward. A second USAMU team coached by Tomlinson took second place. In the 1,000-Yard Team Match, Praslick’s team won in the Any Rifle Any Sights Division by 52 points. Staff Sgt. Daniel J. Peters captained the team made up of Cooper, Green, Tomlinson, Dement, Roberts and Pfc. Sherri Jo Hurd. In the long-range matches, USAMU soldiers shoot modified M-16A2 rifles and the 6.5×284 match rifles with scopes or iron sights to hit a 10-inch X-ring target from the prone position at 800, 900 and 1,000 yards. The USAMU also took home some individual trophies as well. Green won the Interservice Long Range Championship in the Any Rifle Category and Sigrist took the Service Rifle Category. Green was the winner in the Interservice 1,000-Yard Match. In the 600-Yard Match, Dement won the Any Sight Category while Craig won the Service Rifle Category. Share the post "Army Marksmanship Unit Teams Dominate Interservice Match"
It does not count. They are “hired guns” (for the most part) and the Marines have new 1st time shooters every year!! Congratulations to the Army. With a force double the size of the Corps and more on the line for recruiting the Army needs all the help they can get. The Army has more at stake, and needs all the good press they can get. With Commanders less likely to let Marines out of present duties, training, and short dwell time between deployments. This will continue, but all is not lost when we will this war the Corps will be back!!!!! After all Combat is more appealing to Marines than shooting competitions!! (marines aren’t the bad dudes they want people to believe they are). [Edited]. WOW, how do I respond to that and not upset lots of Army veterans that served proudly. I will start like this my father was in the Army during Vietnam and will be the first to tell you that during that era wasn’t a good time for any branch of the Military. Not that good people didn’t serve. The big deference is that most didn’t want to be in the Military they were drafted. As for today it is a totally different Army and Marines. Now from my 14 years on active duty, 3 ½ years as a Recruiter and have been to Iraq and served with the Army. I can tell you that if the general public new what was being recruited into the Army right now they would be appalled. I was a Recruiter from 2002- 2006 as you know this is during the current war in Iraq. The Army in my area lived off the young men we couldn’t touch. People that could not get into the Marine Corps where do you think they went? The biggest reasons we could not touch them? Drugs, Police, Education, Tattoos, and Medical problems. If you would like some Insight into the current standards take a look at some of the documentaries done on Basic Training over the past few years. • Executing Title 10 and Title 32 United States Code directives, to include organizing, equipping, and training forces for the conduct of prompt and sustained combat operations on land. • Accomplishing missions assigned by the President, Secretary of Defense and combatant commanders, and Transforming for the future. The official mission of the Marine Corps is established in the National Security Act of 1947, amended in 1952. Marines are trained, organized and equipped for Offensive amphibious employment and as a “force in readiness.” According to the Act, Marines stand prepared to meet mission requirements. a. Provide Fleet Marine Force with combined arms and supporting air components for service with the United States Fleet in the seizure or defense of advanced naval bases and for the conduct of such land operations as may be essential to the execution of naval campaign. b. Provide detachments and organizations for service on armed vessels of the Navy and security detachments for the protection of naval property at naval Stations and bases. c. Develop, in coordination with the Army, Navy, and Air Force, the doctrine, tactics, techniques, and equipment employed by landing forces in amphibious operations. d. Provide Marine forces for airborne operations, in coordination with the Army, Navy, and Air Force, according to the doctrine established by the Joint Chiefs of Staff. e. Develop, in coordination with the Army, Navy, and Air Force, the doctrine, procedures, and equipment for airborne operations. f. Expand peacetime components to meet wartime needs according to the joint mobilization plans. g. Perform such other duties as the President may direct. This is to Daniel .I hope your retied USMC will even claim you. What branch of the service are you in or has been in ? How many tours have you been deployed to Iraq or Afghanistan? What unit was the first to fight its way to Baghdad, 1st Tank Battalion, What Army unit cleaned out Fallujah? What Army unit fought and secures An Bar Province ? I served 4 tours in Viet Nam, Infantry platoon commander,wounded 4 times ,2 years in Naval Hospital San Diego.If are so big and bad why aren’t you defending your country, not playing rugby in college.Try playing a real game,DEFENSE OF YOUR COUNTRY, if you have the balls for it. I have your answer, how about 7 Cavalry Regiment, and 2nd Battalion, 2nd Infantry Regiment. Let’s not forget the Army’s 1st Battalion, 5th Infantry Regiment, equipped with Stryker Vehicles, were tasked to surround the city. Also, the reason the marines led the fight is because it was their territory. They were there to releive the 82nd Airborne who has been overused by this point. The Army may be the largest branch, but we were stretched thin, to the point of 1-2 year deployments. We needed other branches to step up and the Marines did. But lets not give them all the credit. I’m sick of reading all these headlines that say all the great things the marines do, but they never mention the soldier that went before them or that was their with them. one more point. I work with a retired Marine and I was surprised when he told me that Marines shoot at stationary targets in basic training. Why would you train on stationary targets? Do they did their enemies on the battlefield will stop moving sothey can shoot them? The trains their troops on MOVING targets, maybe thats why we shoot better. Stop with excuses (all the Marines best shooters are deployed). I’ll take a Army trained Infantry Over a Marine trained Infantry anyday. Where do Marines go to learn how to jump out of plains? If you said the Army, you are correct. Just so you know Marines do fire on moving targets and qualify on them as well. We also train to fire to 500 yards with the M16A2 the Army trains to 300 yards. If you read my post you will see that it is part of the Marine Corps to help develop airborn operation with the Army, Navy and Air Force. Why do we train at an Army base for jump school? If you know what you where talking about, you would know that’s the Army’s Mission. It is not a mission of the Marine Corps to jump a large amount of Marines into combat. It is the Marine Corps Mission to attack beach heads. It is the role of a small amount of Marines to jump in a head of an amphibious assault and gather intel. From the stand point of cost savings for the tax payer it only makes sense that the branch that has the highest need would own the school. Tanker school, and Artillery also belong to the Army. It only makes sense. The Army has more people to train those fields. How ever the Army trains its Engineers for the Assault Breechers Course at Camp Lejeune. So this point makes no sense and has no bearing on who is better. I will take Marine Infantry over Army Rangers any day. I am sick of the squalling. Cred: Marine Infantry. I had the pleasure of serving with many branches. Saw some good, saw a lot of bad. Everyone is toting their weight right now. Yes, you do get boot jarheads screaming (unknowingly) at the top of their lungs Oo-rah. The ARMY just doesn’t get our mission. YES you guys have better STUFF and training, but it is the Marine ethos that sets us apart. Bravo to ALL who served. You can drink from my canteen any day.